We provide high-quality transportation services with special emphasis on safety, reliability, comfort, and timeliness, with transparency, integrity, and excellence in customer service at market-competitive rates. The southernmost point of the United States, the beaches that Ponce de Leon explored, the location of Hemingway's creative spells, the site of the original Tiki Bar, the birthplace of the Rum Runner, and the land of Margaritaville. The Florida Keys are nothing short of a tropical paradise. With their flavor of a happy nautical folklore, with a picaresque laid back environment, surrounded by inestimable beauty, they have captivated the hearts and imagination of countless movie stars, musicians, writers, and tourists. Looking for things to do in Miami and Fort Lauderdale? Take a sightseeing excursion and experience South Florida like you have never before, with professionally guided Metro Shuttle tours. Starting with Key Largo, the sights become bright turquoise water and white sands, and local marine folklore. The sounds become that of the water and wind, a variety of ocean birds and the light tolling of pulleys tapping against masts. Countless small islands connected by a bridge chain, for hours, key after key, after key, with the Atlantic Ocean on your left, and the Gulf of Mexico on your right as you head down to the southernmost point of the USA. 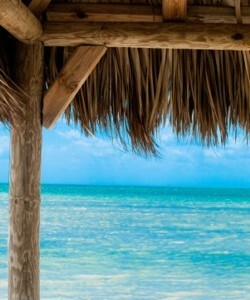 Along the way, you get to spend some time at the original Tiki Bar and perhaps have a Rum Runner, or sample some of their original drinks, you could stop to play with dolphins, pick up souvenirs, an authentic Key Lime pie, keys style sandals, cigars, or even a colorful hammock. All the hand made things you would expect to find in a tropical paradise. Seven mile bridge, one of the longest bridges in the world, provides a truly majestic view of the waters, islands, sun, and breeze of the tropical beach paradise. The rest stop at the bridge, is a legendary place representative of the beauty of the area, with warm, clear, shallow water, over a sand bar out until the eye can see, hand made palm leaf hut and benches. As with anything, words don’t do justice to pictures, and pictures don’t do justice to the actual place. Being there and feeling the wind in your face, the warm sun on your skin, and the salt water smell amidst so much beauty… It is a place that will surely take your breath away. 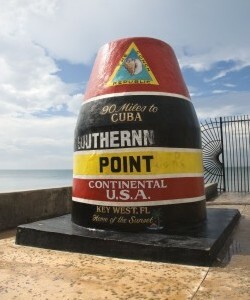 These sights, smells, and sounds, change to the flavor of the different keys all the way down to Key West. Once there, you can rent a scooter to explore, ride the famous Conch Train, go out on a fishing excursion, view the marine museum at the Key West Aquarium, hike through nature trails, take a guided tour along the ramparts and cannons of Fort Taylor, window shop the creative crafts and styles in the stores of Duval Street, visit Ernest Hemingway's house, or take a picture at the southernmost point of the USA buoy. A very special adventure available is to sail off to the Florida Keys Marine Sanctuary, in the pristine waters of the Marquesas Keys, and scuba dive to see a real sunken shipwreck, or the third largest barrier reef in the world. Or perhaps you would enjoy to simply slow down and spend some time on the beach. 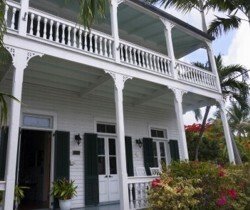 Regardless of your preference, Key West is a place that has something to fit your style. The Florida Keys are a very impressive and fascinating learning experience, which is best shared with friends and family. Remember to take a lot of pictures, and bring back some special souvenirs so you can always remember the adventure, and experience of the Florida Keys. 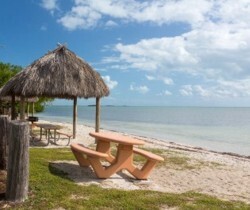 This tour includes some time at the Tiki Bar in Isla Morada, some time at the 7-Mile Bridge rest stop, 3 hours in Key West to explore, and everything you need to have a great feel for the Florida Keys. The time allocation for each stop of the trip will be adjusted based on what you want to see and experience, and an agreement you reach with your driver/tour-guide. If you want more time to swim with dolphins in Key Largo, and less time in on the beach in Key West, no problem. If you want more time at the Tiki bar, and less time in the water at the rest stop, great! If you want short stops along the way and more time in Key West to fit a larger diving or fishing trip, it is a wonderful plan. You are in control of your experience. Just remember to bring loose fitting, comfortable cotton clothing, suntan lotion, sunglasses, a waterproof camera, a bathing suit and towels, and a fun attitude. And whatever you choice of stops and activities, be ready for a truly breathtaking and memorable experience. Sign up for your tour! Don't let this unique opportunity slip by. Want things to do in Florida?